The Public Hall, built in Windsor Street in 1853 was the headquarters of one of the largest removal contractors and removers in the United Kingdomin the late nineteenth century. Mousell Brothers set up their spacious warehouse and offices, at a time when it was common to sell house contents by auction when moving from one property to another, and simply buy new on arrival elsewhere. The business was directed from the outset by a Mr H Cooksey who came to the “Queen of English Health Resorts” from Exeter, where he had been involved in a similar enterprise. As the business prospered Mansell brothers set up branches in London, Birmingham, Liverpool, Manchester, Leeds, Gloucester, Exeter itself, – and Paris. The four storey Windsor Street premises could accommodate up to 400 separate van-loads of furniture, the contents of up to 200 individual residences, safely under one roof. The premises were kept scrupulously tidy and maintained at a steady dry temperature by system of heating “with hot water,” moths were kept at bay by Persian insect powder and naphthaline crystals, and chemical “Fire Queen” extinguishers placed on every floor to guard against the outbreak of fire. (Mr Cooksey being a trained exponent of the use of these latter). As a further precaution against fire, electric lighting we installed throughout the building. Furniture was transferred from floor to floor by means of a hoist so that once numbered and registered, it could quickly be retrieved by the same method as soon as required. Mousell Brothers owned 350 Pantechnicon vans for the removal of goods by road rail or sea, and employed experienced packers: they were noted for their care in packing and reasonable charges. A representative would attend by appointment regardless of distance to provide clients with an estimate of the eventual cost. In addition to the warehouse in Windsor Street, Messrs Mousell also had a branch storage depot in Chandos Street, a reflection of the constantly increasing requirements of the business. The Windsor Street site included a large public room known as The Public Hall which was extensively used for auction sales, public lectures, concerts and recitals, and in April 1888, the Cabmen’s Supper, sponsored jointly by Messrs Mousell, Lucas, Blackwell & Arkwright’s Brewery, and Irwins of Bedford Street, who provided the table decorations and potted plants. In May 1893, they generously sponsored a music concert in aid of the widow and children of a recently deceased clergyman who had been a classics tutor in Leamington. 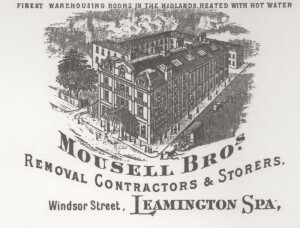 Mousell Bros Ltd were not without problems: in 1881 a former employee and resident of Windsor Street set up in competition with them as a packer. 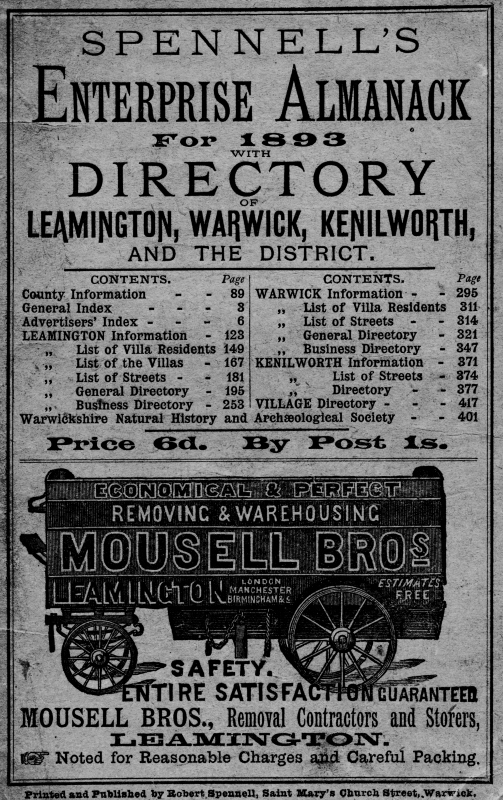 He advertised regularly in the Leamington Courier as a former Mousell Bros packer and offered cheaper rates! A few years later, Mousell’s had to take a client to court for failing to pay in full the account for packing and removal of her property from Leamington to Folkestone. On receipt of her property the client had signed the dispatch note, complimented the foreman on a job well done and gave him a tip of five shillings, – and then refused to pay in full on the grounds that some items were damaged or missing. Mousell Bros therefore retained one chest belonging to the client and only surrendered it when judgement was given in their favour after evidence was taken from the auctioneer from Locke’s who had taken the original inventory, supporting Mousell’s claim that many of the goods were not of the first quality and could not have been damaged as claimed in transit. 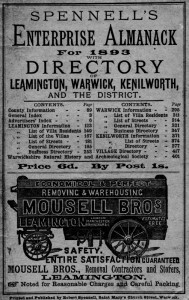 On another occasion Messrs Mousell posted a notice in the Leamington Courier to the effect that within a month of the notice, certain goods, unpaid and unclaimed “for some years,” would be sold to defray the costs of keeping them.